In 1857, Queen Victoria chose Ottawa as the capital of united Canada. The city was the focus for the booming lumber industry in the Ottawa Valley. The new appointment conflicted with the city's character. Ottawa tried to find a balance between its new role of capital and its status as the largest supplier of lumber to the American and British markets. The lumber barons who owned the mills at the Chaudière and Rideau Falls participated in every level of government, and shaped the city through the nineteenth century. However, the men and women working in the industry also influenced Ottawa's development. They arrived by the hundreds to work in the lumber shanties and mills throughout the Ottawa Valley. Merchants sought their business, while genteel society shunned them. Fortunes were made and lost, but the workers in the lumber industry remained. In 1806, England searched for a new source of lumber, as Napoleon's fleet had blocked the European source. England turned to the colonies for new imports, and found them in Canada. That same year, Philemon Wright took the first raft of squared lumber to Québec City from his farm in Hull, and opened the Ottawa River for lumbering. The source of the Ottawa Valley's industry was the white pine forests. Like Wright, the first people who were involved in lumber were farmers who needed to clear the land, but soon others were exploiting this valuable resource. Lumber camps emerged in the wilderness, where men worked through the winter to cut down ancient pines. This was a lifestyle that would endure for decades. Lumber work was long and rough. From fall until spring, men worked in the forests cutting the ancient pines. They worked six days a week and did chores like laundry on Sunday. The grueling schedule left a little time for pleasure in the evenings, but songs and the Stag Dance helped to pass their free time. to centres like Ottawa to spend their new wealth. The influx of rowdy pleasure-seekers earned the disdain of Ottawa's upper class, and gave Ottawa a reputation for bawdiness. French Canadians found a hero in Jos "Mufferaw" Montferrand, who was immortalized for anglophone audiences by Stompin' Tom Connors. A blend of fact and legend, Montferrand fought for the respect desired by the mostly Catholic francophones who lived in the lumber camps. White pine was prized for the quality of its wood. The forests in Ontario and Québec were heavily harvested beginning in the nineteenth century, lasting well into the twentieth. The trees that replaced the white pines were younger and inferior in quality, which negatively impacted the lumber industry. Very few old growth pines remain in Ontario today. Before trucks and trains, the economical way to transport lumber to the mills was on the water. Logs deposited by the edge of rivers and streams would lie on ice until the spring break up. 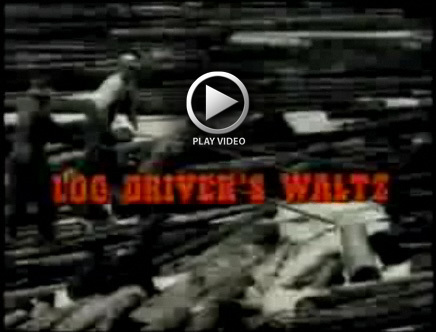 Once in the water, the logs were steered onto the main body of the Ottawa River. 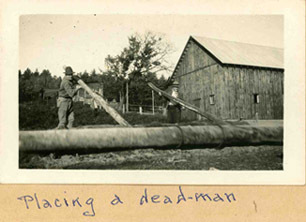 For the duration of the journey to Ottawa, lumberjacks kept the logs from jamming and being damaged. This was dangerous, wet work, and many men fell victim to accidents and waterfalls. The life was romanticized, and heroes emerged from the hundreds who traveled down this ancient route. The river is no longer used for the transportation of logs, but sunken pines that date from this era can still be found beneath the surface.